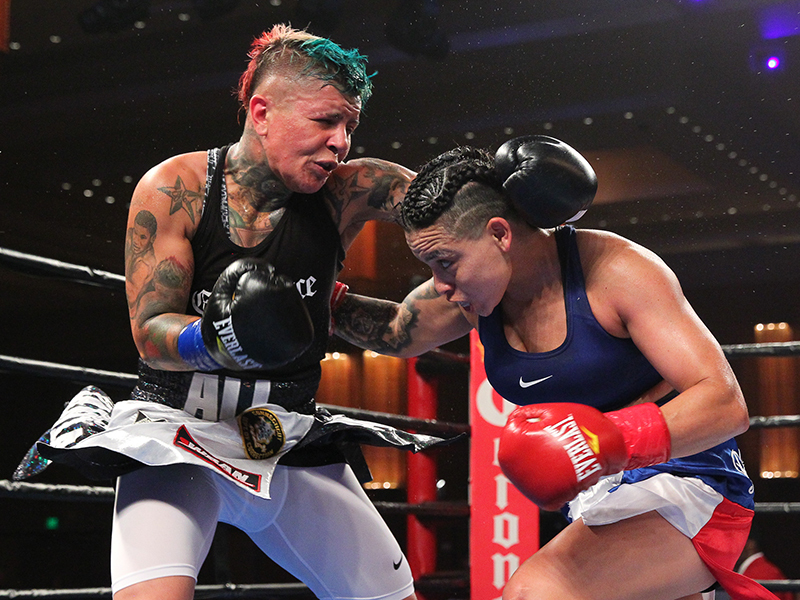 Wildly popular Shelly Vincent has overcome numerous obstacles and personal heartbreaks to become world champion, as well as the first female to be named Boxer of the Year, in 2016, by the Connecticut Boxing Hall of Fame. She had a relatively brief amateur career, finishing with a somewhat misleading 11-4 record, because she was the 2000 Connecticut State, 2001 Connecticut Golden Gloves and 2000 Bud Belt champion. Undefeated through her first 18 professional fights, highlighted by her WIBA super bantamweight winning title fight in 2013, Vincent’s first loss was by way of a tough 10-round majority decision in 2016 to her arch-rival, Heather Hardy, in one of the most high-profile women’s boxing match in recent history. Shelly has dedicated her non-boxing life to supporting children, which is evident by her large fanbase rooting her on during fights. Her non-training time is spent with her life partner, pro boxer Jen Salinas, and her step-daughter, Gigi. Adorned with multi-colored hair, body pierced parts and heavily tattooed, some paying tribute to her late mother and Salinas, Shelly’s walk-through-hell-to-sunshine tattoo tells her real-life story. When she finally hangs-up her gloves for good, Vincent plans to open a gym and train up-and-coming boxers, especially young ladies traying to make their marks.